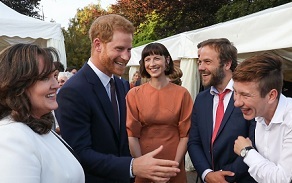 Irish Academy CEO Áine Moriarty introduced Irish actors to the Duke and Duchess of Sussex at the British Ambassador's Residence at Glencairn during the Royal Visit to Ireland. Invited guests included Caitriona Balfe, Moe Dunford, Amy Huberman, Aisling Bea, Evanna Lynch, Alex Murphy, and Barry Keoghan, along with 'Derry Girls' writer Lisa McGee and TV presenter Lucy Kennedy. Other industry guests who attended the event included Minister for Culture Josepha Madigan, RTE Director General Dee Forbes, Shinawil CEO and Irish Film Board member Larry Bass, director Neasa Hardiman and Cartoon Saloon director (The Breadwinner) Nora Twomey.